The ServSafe food handler certificate is the most popular certification awarded by ServSafe. Sometimes it’s also called a food handlers card or a food workers permit. The purpose of the certification is to ensure that food service workers have an understanding of basic food safety principles. Below is an example of the type of questions on the ServSafe food handler assessment. The real assessment contains 40 questions, but this example only contains eight. You need to achieve a minimum score of 75% to pass the assessment. That means you have to answer at least 30 questions correctly on the real assessment, or six on the example below. Many states, counties, and cities require food handlers to obtain a permit or food handlers card. Usually, they are required to have the certificate within 30 days of the day they are hired. A food handler is anyone working in a food service establishment (like a restaurant) who has direct contact with food or anything that the food touches. 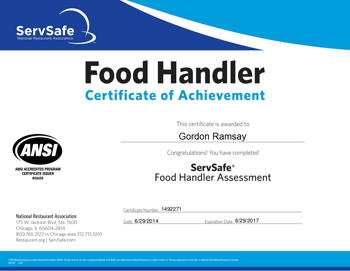 Below is an example of the food handler certificate awarded by ServSafe. Usually, it will be sufficient to just have the certificate with you, but sometimes you may have to register it with your health department. Before you take the assessment you will need food safety training. There may be instructor lead food handler classes available in your area. Sometimes they will be provided by your local health department, restaurant association or a private company. But unusually people choose to take the online ServSafe food handler course instead. The advantage of the online course is that you can complete it at your own pace. The entire online course and assessment can be completed in less than two hours. This is a demonstration of the real ServSafe food handler online course. You will need flash installed to try the demonstration. Unfortunately, the online course may not function properly on Safari and it’s not supported at this time. If you only have access to a Mac, iPad or iPhone you should find another alternative to the online course.